This week, Your News to Know delivers your weekly roundup of the top news stories involving gold and the overall economy. Stories include: Gold becoming the elephant in the room, another reason to be bullish on gold, and Guggenheim’s 18 karat toilet is now open to the public. 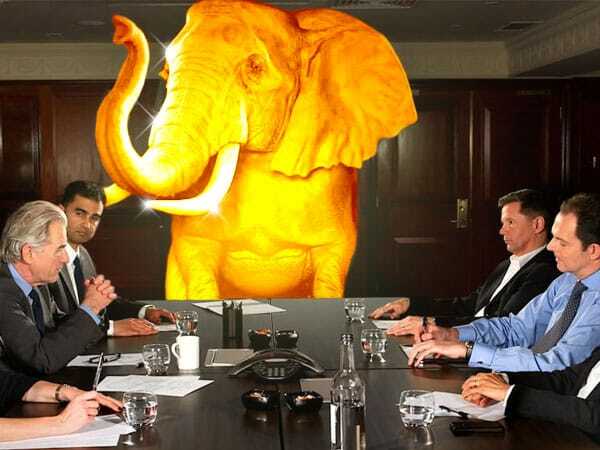 Is gold now the elephant in the room? Kitco News’ Neils Christensen noticed an oddity while watching the coverage of CNBC’s Delivering Alpha conference: despite gold being up almost 25% so far this year, most speakers seemed to ignore the metal. This is even more puzzling considering that the markets are in an even worse position than they were at the start of the year when gold was widely talked about – the equity market’s bull run has exhausted itself and the Federal Reserve looks as if it’s heading towards disaster. Founder of Elliott Management Paul Singer, who has been bullish on gold since early spring, was an exception in that he shared some words on gold while focusing on radical monetary policies that make this a dangerous time to be in. Mark Carhart from Kerpos Capital might have also given a silent nod to gold in his speech in favor of trend investing as opposed to sticking to traditional asset classes. Gold might have been the elephant in the room, but the attending investors and money managers still talked plenty about the monetary disorder that supports it. As Christensen explains, Kynikos Associations’ Jim Chanos declaring “I have no idea what is going on” sums up the sentiment well, just as it would have around the start of the year when gold first started gaining traction. The world’s biggest asset manager recently gave Americans another reason to be bullish on gold. BlackRock’s Russ Koesterich is no stranger to the metal as he has been bullish on it for months. Now, he sees another reason to support his stance – one that should alleviate any concerns about gold’s rally slowing down. Volatility in the equity market has been blowing up, with the CBOE Volatility Index rising almost 45% since mid-August. With this in mind, Koesterich urges people to stick to gold as equities aren’t likely to stabilize any time soon. Koesterich also touched upon interest rates – while some market watchers are already pricing in another rates hike, Koesterich sees no reason for Americans to worry about gold prices, as real yields remain low. “While investors appear more convinced that the Federal Reserve (Fed) will indeed hike rates later this year, real yields remain well below where they started the year and even further below their long-term average. In other words, monetary conditions continue to be incredibly loose and supportive of gold,” he said. It’s worth noting that BlackRock is also extremely bullish on gold and has been increasing its exposure to the metal since the start of the year. Last week, the Solomon R. Guggenheim Museum in New York City opened a unique exhibit to the public: an 18 karat gold toilet made by Italian artist Maurizio Cattelan. The sculpture is a nod to Marcel Duchamp’s “Fountain”, an artistic urinal presented in 1917. “Cattelan’s toilet offers a wink to the excesses of the art market, but also evokes the American dream of opportunity for all, its utility ultimately reminding us of the inescapable physical realities of our shared humanity,” said the museum’s press release. Even more unusual is that the expensive toilet is open not just for public viewing, but use as well: those who purchase a $15 museum ticket will be able to try out the toilet since it’s connected to the building’s plumbing system. Cattelan’s sculpture will require special attention, however: cleaning crews will have to clean the toilet after each user with medical wipes instead of industrial strength chemicals, and it will also be steamed and polished occasionally. Furthermore, a security guard has been assigned to the spot to prevent vandalism and ensure order is maintained. The sculpture, which will be open indefinitely, is priced somewhere between $1 million to $1.7 million at current gold prices.